Jazzmin Cooper knew that she wanted to do something in the helping professions – she just didn’t know what. From an early age, Jazzmin was committed to improving her South Los Angeles community. She attended King Drew Magnet High School of Medicine and Science while volunteering more than 2,000 hours at her local church, community center, and hospital. Her academic record and extracurricular activities earned her a Gates Millennium scholarship to Rensselaer Polytechnic Institute in Troy, NY, where she received an undergraduate degree in biochemistry/biophysics, followed by a MPH in community health and prevention at Drexel University in Philadelphia. After graduation, she worked as a field coordinator for “Healing Hurt People,” a violence prevention program at level-one trauma centers throughout Philadelphia. But despite all the credentials and experiences, Jazzmin still remained undecided about how best to channel all her varied interests into one fulfilling career. Finally, she talked to a friend, Jordan Anderson, SSA ’16, who suggested that she take a closer look at SSA and its Graduate Program in Health Administration and Policy (GPHAP), which would allow her to develop the skills she needed without sacrificing her passions. 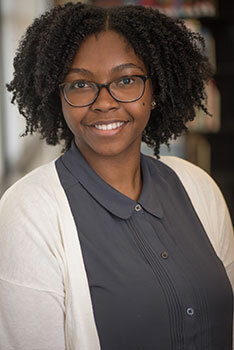 In her first-year field placement, Jazzmin worked at Illinois Perinatal Quality Collaborative in Chicago, focusing on patient and family engagement in the Neonatal Intensive Care Unit to improve birth outcomes for women and infants. “Working on projects didn’t just give me practical experience, but boosted my confidence and made me a better communicator with various stakeholders,” she said. Jazzmin also served as a GPHAP Research Assistant with Professor Curtis McMillen. Each year, GPHAP funds paid internships and RA-ships for students who work with faculty in divisions across the University of Chicago. Jazzmin found a mentor in her field supervisor, SSA alum Patricia Lee King, AM, ’04, whom is constantly finding new ways for her to grow professionally and be optimally prepared to improve the lives of those most in need. Such rigorous training has Jazzmin thinking more broadly than ever – including considering a role in federal government, where she can affect even greater change.